Ten minutes before the lunch break on Day 4 of the one-off Test between India and Bangladesh at Hyderabad, an innocuous carrom ball drifting down the leg side from Ravichandran Ashwin found the glove of the sweeping Bangladesh skipper Mushfiqur Rahim and safely nestled in the wide gauntlets of the alert wicketkeeper Wriddhiman Saha. And with that, Ashwin, in his 45th Test for India, became the quickest bowler to reach 250 wickets in Test history, besting the legendary Australian pacer Dennis Lillee comfortably by three Tests. He had wrestled the Indian record from his current coach Anil Kumble quite easily as well, by eight matches. Since his debut in 2011 versus the West Indies in Delhi, where he picked up a match haul of nine wickets, bowling India to a win, Ashwin has been climbing the "Quickest to ___ Wickets" charts. He was the eighth fastest to 50 wickets (in nine Tests) when he got one through the gap between Nic Compton's bat and pad in the first Test of the series against England in Ahmedabad in 2012; the sixth fastest to 100 wickets next year, in his 18th Test, which was to be the final Test of Sachin Tendulkar, when Darren Sammy top edged a wild slog; the fourth fastest to 150 wickets (29 Tests) when Imran Tahir was undone by a classic offbreak in the first Test of the series against South Africa in Mohali in 2015, inside edging to short leg; and the second fastest to 200 wickets (37 Tests) when the terrific New Zealand captain Kane Williamson was beaten by sharp turn and trapped LBW in the first Test of the series in Kanpur last year. 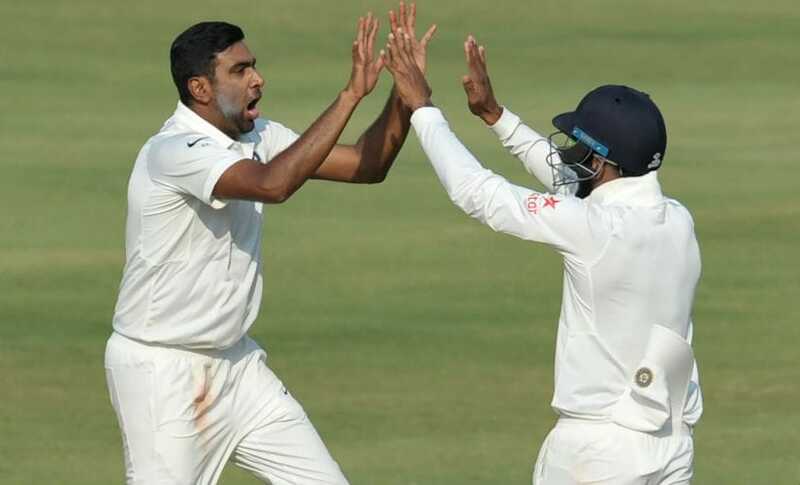 Since 6 November, 2011, when he stepped onto Delhi's Feroz Shah Kotla, and ripped an offbreak to beat the ill-advised cut shot of West Indies' Darren Bravo to castle him, no other bowler has taken more wickets in Tests than Ashwin. Sri Lanka's Rangana Herath who has accrued 246 wickets in six Tests since Ashwin's debut, comes a close second. Even as he has been climbing the ladder of history in a seemingly predestined fashion, there have been a few bumps on the road in his career. Ashwin had relatively poor returns during the tour of Australia in 2011-12. The home series in 2012-13 versus England clearly highlighted how far Ashwin still had to go to be an elite spinner, as Graeme Swann and Monty Panesar bowled England to a 2-1 series win. He was dropped from the side after he could not bowl South Africa out on a final day Johannesburg pitch in 2013 and did not return for six Tests, and was left out again in Adelaide against the Australians in 2014. In the 53 Tests India have played since his debut, Ashwin has missed out on eight Tests - thrice in England; twice in Australia and New Zealand each and once in South Africa. For a player who comes across as enormously confident and cocksure, being dropped from the team must have been a big jolt. It was during the Adelaide Test in 2014, the last time he had been dropped from the Indian Test side, that he believes the penny dropped. Instead of moping around the dressing room, Ashwin hit the nets every day of that emotionally fraught Test match, staged in the wake of Phil Hughes' tragic death, and worked out the kinks that had crept into his bowling action with bowling coach Bharat Arun. He needed to re-work his loading action, his feet alignment at the crease and his delivery arm angle. The following table lists Ashwin's record before he was dropped at Adelaide, and after it, for his entire career, as well as in Tests at home and abroad (all numbers updated till close of play on Day 4 of the ongoing Test in Hyderabad). For a long time he was considered good only for home tracks that took turn. In 11 Tests away since Adelaide (three in Australia, four in West Indies, three in Sri Lanka and one in Bangladesh), his average and strike rate have significantly improved and are trending ever closer to his home record. Even his record on Indian pitches have taken a dramatic turn since he was dropped in Adelaide - from averaging 24 runs and 51 deliveries per wicket to 20 runs and 44 balls. As such, there is no harm in being successful at home conditions. Teams tend to play more than half their matches at home, and a wily bowler who could take advantage of whatever help that's available from homespun pitches is an asset to any Test team. Mitchell Johnson took advantage of the pace and bounce that was present in the Australian pitches to terrorise England in the 2013-14 Ashes. James Anderson has had a significant amount of his success in the helpful conditions of England. A lot of the batsmen score a majority of the runs in home Tests as well. If home conditions were all that was required to excel as an international player, there wouldn't be the clear daylight that Ashwin has opened up between himself and rest of the great bowlers that have played for India, as shown in Table 2. [Data courtesy: Kartikeya Date]. Ashwin averages nearly a wicket more than Kumble per home Test at a better strike rate and average while also bowling slightly a lower percentage of the overs in the matches. He is nearly two wickets per match better than the ethereal left-arm twirler Bishan Bedi! One would be remiss if one of the major contributing factors to Ashwin's success in the last 27 months, besides the work on his bowling action, is not acknowledged: Ravindra Jadeja. Jadeja was the beneficiary of Ashwin's cut from the side after the Johannesburg Test but he also found himself out of the team for a little while. However, when they are picked to bowl in tandem, Jadeja provides the indefatigable control at one end that allows Ashwin to expand on his variations and experiment a bit more to pluck the wickets. In the 20 Tests that have featured them both, Ashwin's bowling is strikingly better than in the Tests without Jadeja: bowling average of 21.28 versus 28.88, and five-wicket hauls of 14 versus 10. With Ashwin and Jadeja also contributing with the bat, and captain Virat Kohli emphasising his keenness in playing five bowlers, it will not be a surprise if both Ashwin and Jadeja suit up together even in matches abroad regularly. It won't so much be a competition for one spot but a partnership that provides India more avenues to 20 wickets in a Test. Lillee, whom Ashwin replaced as the quickest to 250 wickets, is the current holder of the fastest to 300 wickets [56 Tests]. With the final day's play at Hyderabad underway, and four more home Tests against Australia coming up, there is every chance that Ashwin would supplant Lillee on that list as well. The post-Adelaide-2014 Ashwin will certainly have his chances to set right some wrongs as India embark on tours of South Africa and New Zealand beginning late 2017 as well. Having turned 30 only five months ago, there is still more to come from Ashwin than what we have seen in the Test arena. Perhaps even Kumble's 619 won't be safe by the time he calls it a day.